The Venue: There are two challenges faced when eating before attending a theater performance: getting portions that are filling to ward off hunger pangs -- yet not overly so to cause drowsiness during the performance; and, speediness of service. For these reasons I tend to grab something to eat at the bar before going to the theater. Prior to a recent performance of The History Boys, I stopped at 14K Restaurant, five blocks north of the Studio Theatre. The Cast of Characters: On my first outing, I tried the Chesapeake crab cake ($13) served, according to the menu, over creamed spinach and Pommery mustard. Instead, as an uncredited understudy, the supporting side dish was a warm, Southwestern-styled corn salad and a crisp roll filled with guacamole and garnished with an orchid. The crab cake was good -- not too much filler, lumps of crab – but the corn salad – with flecks of pancetta, tossed in a roasted, tomato vinaigrette – was even better and complimented the crab nicely. On another visit, I ordered the steamed mussels ($14) in a white wine, herb broth. Yet, I couldn't figure out what herbs were used; there wasn't a speck of green in the broth. The mussels were bought out in a large, 3-quart Dutch oven, overwhelming the pound or so of mussels. Perched on top of the mussels was a lone piece of toasted cheese bread; not enough to sop up the broth. However, in my book, you can rarely go wrong with mussels. Both meals were served with bread. On one occasion, the basket contained two types of rolls: sourdough and rye; on another, pretzel bread sticks as well as the sourdough rolls. The bread, especially the sourdough, was quite good. But answer me this: how does bread come out of the kitchen steaming? Were they served hot from the oven? Performance: Unlike table dining, there are certain risks inherent in sitting and dining at a bar. If the bar is crowded, you'll have a tough time getting the bartender's attention. At other times, when the bar is slow, the staff is either busy setting-up or nonexistent. At 14K, there is an additional challenge: the bar is a circle, bisected by the drink station. On one occasion, while the bartender was servicing one side, the other side was being neglected. I had a hard time attracting his, or anyone's, attention to get water, ask about the corn salad, inquire about my meal and get the check. The other time, the staff hovered; whisking away the bowl anytime it contained five or more discarded mussel shells. The pace of the kitchen left a lot to be desired. On my two visits, it took an average of 20 minutes, once ordered, for food to arrive. Maybe my own timing was off; I had allotted 45 minutes for a somewhat leisurely, yet quick, meal before show time. I know now to build in additional time in order not to feel rushed. Set Design: 14K takes great pride in appearance and presentation. The room is light and airy with lots of open space. The circular bar provides a semi-restricted view of the hotel lobby or the restaurant. Albeit located on a busy, rush hour intersection, the outdoor dining patio is ideal for people watching. The kitchen does take great care in plating and showcasing the meal. A single orchid graces the guacamole roll, or a slice of bread atop the mussels, confirm this. The Mark: 14K has a lot going for it, as a pre-theater dining experience: it’s proximity to the Studio theater; the variety offered on the bar menu; the selection of by-the-glass wines; the value for the money. Yet, it also has a few major distractions… the pace of the kitchen and staff attention left a lot to be desired…and should be avoided before an evening or matinée show. For a leisurely meal, with patio dining, 14K deserves a second chance. You don't usually expect to find good food at a bar. A bar is where you typically find great munchies like nachos, cheese sticks, mini-burgers, and maybe...maybe if you're lucky, you'll find some Asian-inspired potstickers. Café Saint-Ex isn't your typical bar though. The first time I went to Café Saint-Ex, I mistook it for your everyday bar. It was when I first moved to DC, long before I started this site, and I think at the time I was looking for a place "to party", or something like that. I believe it was after a 9:30 Club show. My friends and I waited at the bar nursing some beers while we waited to get in downstairs, but ended up leaving when that took too long. Little did I know, five years later, I'd be returning for a completely different reason. This time, it was before a 9:30 Club show (Carbon Leaf to be exact), and we were there for dinner...instead of a party. Amy and I were having a night out on the town without Noah, our first in about three weeks! We were looking forward to a relaxing, casual dinner and that's exactly what we got. We enjoyed the experience so much that we returned two nights later for dinner, but this time we took Noah with us. When we were there the first time we noticed that there were some other people there with children, so we wouldn't feel out of place with him. Also, the louder atmosphere made it ideal if he decided to throw a tantrum or scream out loud, which only happens occasionally, but you never know when that shortened afternoon nap will catch up with him. 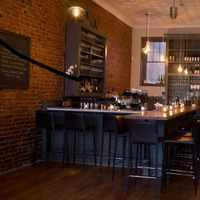 As far as food is concerned, Café Saint-Ex is definitely doing things right, and after reading Chef Barton Seaver's Bio on the Café-Saint-Ex web site, it's not surprising. You can get an extremely good meal there for a very reasonable price. For appetizers, the wood-grilled calamari (or actually anything wood-grilled) is tender and makes you wish everyone was making calamari like that. If you're expecting those typical rubbery rings of calamari that you get everywhere else, however, you'll be sorely disappointed. This calamari is served whole. The beet salad rivals that of any that I've had at other restaurants, with a goat cheese that doesn't overwhelm the beets, but also isn't so bland that you can barely taste it. And a horseradish vinagrette punches up the entire dish. As I said before, anything wood-grilled or maybe anything that's cooked close in proximity to where the wood-grilling happens is very good. Most of the fish is cooked this way and I'd recommend you try it. I don't think the smoky and spicy flavor will be to everyone's taste, but you've got to try it once to see. So far I've tried the salmon and flounder and both were a big hit with Amy and myself. For desserts, the smooth and creamy goat cheesecake comes looking like a giant scoop of ice cream on top of a crumbled graham cracker crust. OH MY GOD was it good. This rivaled Ann Amernick's cheesecake I tasted at Palena not long ago. Seriously people, if there is one reason alone to go to Café Saint-Ex, it's this cheesecake. I hope they don't take it off the menu anytime soon. I should mention that the price fixe option that Café Saint-Ex offers is a very good deal. Before 7, three courses are only $28 per person, and after 7, they are $32. Our bills have consistently been below $100 with a bottle of wine. The wine list at Café Saint-Ex is very European with the occasional appearance of a New Zealand of California wine. Prices for bottles range from $24 to $75 with a majority of them falling in the lower end of that price range. The host/hostesses are friendly as are the servers, who don't seem to have enough time to be overly congenial, but are quick to help you with the menu and point out the price fixe option to save you some money. Corkage: I didn't check. Call the restaurant to see. Parking: Street: Street Parking. I found it pretty easy to find a parking spot on the streets in the area. Reservations: Not Taken. First come, first serve. Dinner rush starts at about 7. If you get there before that, you probably wont have to wait long. Baby friendly rating: 3 Diapers. The atmosphere is loud, which makes it great for children, and the waitstaff and hosts seem to really love babies. The last week has been pretty boring for me food wise. I haven't been eating out anywhere new. Work and my new dog have been keeping me busy. Mostly I've been eating out and around in my 'hood - Tenleytown. Cafe Ole has seen a lot of me and I have not been disappointed by them at all. I especially like that they bring out water for Ceiba when we come by. She is very appreciative. We actually went there last night - AGAIN! All I have to say is you gotta try the polenta tartufo and ask for some pita chips with which to eat it. Let's see where else have I been eating? Oh, I ate at Sushi Sushi on Thursday night and was kinda disappointed in their crab rolls. I mean, there is no excuse for the low quality crab meat they use there. Their crab meat is about as real as Michael Jackson's nose. I found myself wishing I was across the street at 2 Amys. I had a great brunch with Amy and a friend of her's named Martha. I was not expecting much at all, because we were just stopping at some random place, but it really turned out to be the best breakfast food I have had around here in a while. The place was called Logan Tavern and is right on P st between 14th and 16th by the Whole Foods. I had a breakfast burrito, Amy had the Bacon and Eggs and Martha had a grilled cheese. I want to go back and get the grilled cheese because it looked so yummy. Martha thought it was good too :). My breakfast burrito was very fresh and I enjoyed it very much. Amy only had the eggs and bacon, but she ordered them over easy....AND THEY ACTUALLY CAME OUT OVER EASY! Imagine that?! The rest of the menu looked pretty interesting and I would have ordered some of them if I were not hung over from the night before (breakfast food it the best for hangovers). The arugula, peach and prosciutto salad looked good as well and the lump crap and avocado. Grilled scallops with balsamic glaze, baked Greek cheese with tomato sauce, grilled baby squid...all of them sound good, and those are only some of the appetizers. I think I will be heading back for dinner when I get back to Logan Circle. Well, I think that is everything that has been going on in the last week or so in food. Oh, I almost forgot to mention that an Indian friend of mine from work made me some bhaji that turned out most excellent. He made us this huge container of it and we ended up eating it all in two nights. YUM. YUM. and YUM.